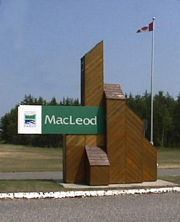 MacLeod Provincial Park is located on Highway 11 in the Municipality of Greenstone, eight kilometers east of Geraldton. Named after an abandoned gold mine, MacLeod Provincial Park is located on a peninsula in Kenogamisis Lake, East of Geraldton. It offers excellent swimming, great fishing in its bays and spectacular wildlife viewing in its marshes. GCF is contracted to maintain the park by the Municipality of Greenstone. Staff are responsible for camp site bookings, general maintenance, facility cleaning and are involved in numerous other park activities to make camp stays enjoyable including preparing for the Geraldton Music Jamboree. The park employs a number of local students during the summer months to ensure that all maintenance is completed quickly ensuring a pleasant and relaxing stay for all park users. © 2019 Geraldton Community Forest , All rights reserved.